January 19th is Robert E. Lee's birthday, an official holiday in a few Southern states. I grew up in Cincinnati, across the river from the South. My BFF Linda was a transplanted Kentuckian and I a transplanted New Yorker so our cultures often clashed. She celebrated Lee's Birthday. Although I am a dyed-in-the-wool Yankee, Confederate General Robert E. Lee is one of my heroes, not for his fighting, but for his peacemaking. 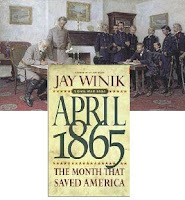 After reading Jay Winik's April 1865: The Month That Saved America, I realized how lucky we are to have had Lee leading the Southern troops rather than a man like Jo Shelby who refused to surrender. So many places in the world carry civil wars over many generations. We have Robert E. Lee to thank for our post-Civil-War world in which North and South manage to coexist peacefully. Windham Fabrics printed a Grant and Lee commemorative fabric last year. 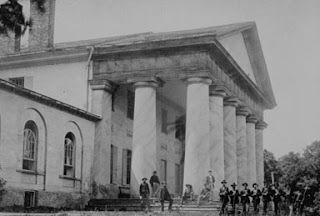 General Ulysses Grant and Lee agreed that Confederate soldiers would surrender their arms but keep their horses and mules to take home to rebuild their farms with no more consequences for the Rebellion. Lee spent his few post-War years as President of Washington College in Lexington, Virginia. The story of Lee's wife Mary Custis Lee (1808-1873) is an American tragedy. She was a great-granddaughter of Martha Washington who grew up on a plantation in Arlington, Virginia, which she inherited right before the war. Mary Lee, afflicted by a severe case of rheumatoid arthritis, was wheel-chair bound by the time War broke out in 1861. Union troops soon occupied Arlington. Mary and her children sought refuge in Richmond. Union occupiers saw an opportunity to create a powerful symbol and to insult Lee by turning Arlington House's front vista into a cemetery. Arlington remains America's national military cemetery. Arlington was Mary's family home, not Lee's, and she only saw it once more after she fled in 1861. She spent her last years on the campus of Washington College. After her husband's death in 1870, the school's name was changed to Washington and Lee University. The Virginia Military Institute has in its collection a quilt made by Mary Custis Lee and her daughters to raise money for the campus's Lee Memorial. Lee's Medallion, Jean Stanclift, quilted by Sharyn Rigg, 2000. Jean Stanclift stitched a quilt interpreting Mary Lee's quilt for our Sunflower Pattern Co-operative. We designed an embroidered laurel wreath for the center to honor Lee. 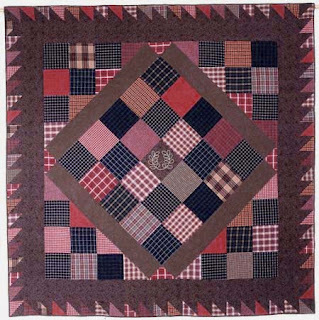 Mary Lee's quilt was a medallion checkerboard stitched of wool and silk combination fabrics in plaids, stripes and checks, the clothing of the era. We used woven cotton plaids and stripes. The catalog says, "There is considerable dispute" about the quilt's origins. It seems unlikely to have been made by Mary Lee who died in 1873 before the fashion for Log Cabin quilts of heavy wools began. And the symbolism of a Log Cabin (associated with Abraham Lincoln) makes one doubt she'd have chosen that pattern. None are attributed in the catalog text to Mary Lee but a few are old enough. What a great way to start my morning. My husband is a history buff. said about Lee's peacemaking ablities. I had heard about Mary's inheritance of Arlington. Yes, it was a tragedy what happened. this book and the Lee/Grant panel. Thank you, that was so interesting and so many things I didn't know. I love hearing about the history of so many of our wonderful treasures.. Thank you for all your historic knowledge! It's great to read about the people behind the quilts! And how things came to be! I enjoyed reading your story! I'm a transplanted Canadian, so I love the history lessons I'm getting through quilting. Thanks! Wow, I learned a lot about Lee and his wife. Thanks so much for sharing the info with us. What an interesting piece, Barbara. It is fascinating how some central characters of the civil war are connected to one another. I am Canadian so it was all new information to me. Thanks for sharing. Thank you. Your link to the Kentucky Historical society brought up a quilt made by Sara Boone. My family is traced to the Boone family. Daniel is a 7th great grand uncle of mine. I had to use the Family Tree Maker relationship tool to find out what level cousin Sara was to me (1st cousin 7x removed). It was neat to find that and see something my ancestors did. Lee is also a big favorite of mine. He was very conflicted about the war and he really struggled on which side to serve as both sides wanted him. Ultimately he decided to defend Virginia. He said he could not fight against her so he must defend her. Thank you so much for such an educational post on the life of Robert E. Lee and his family. I so enjoyed the pictures and writings from the Arlington Museum. I am truly inspired and intrigued by this post. We are distantly related to the Lee family but I have to refer to a family geneology to verify it. But it has given me wonderful inspiration as I document my family quilting history. Thank you again! 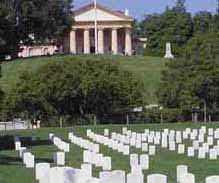 The whole story about their house is sad, but America gained an important treasure, Arlington Cemetary. I visited the house on a trip to Washington,DC. It would have been wonderful to live there. 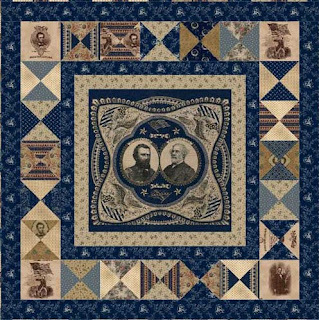 In the first years after the war Lincoln was not yet an national icon and I think many people made log cabin quilts, partly because the are easy to do and you can play with colors and settings. Was the block called Log Cabin from the start?